The details come more than a month after GM disclosed it plans to launch at least 20 new all-electric and hydrogen fuel cell vehicles globally by 2023. Pictured is the Chevy Bolt EV. General Motors expects its electrified vehicle business to be profitable with the launch of its next-generation EV platform in 2021, CEO Mary Barra says. Automakers have been losing money for years on all-electric vehicles such as the Chevrolet Bolt in exchange for meeting tighter environmental regulations while positioning themselves for an expected increase in demand for alternative powertrains. 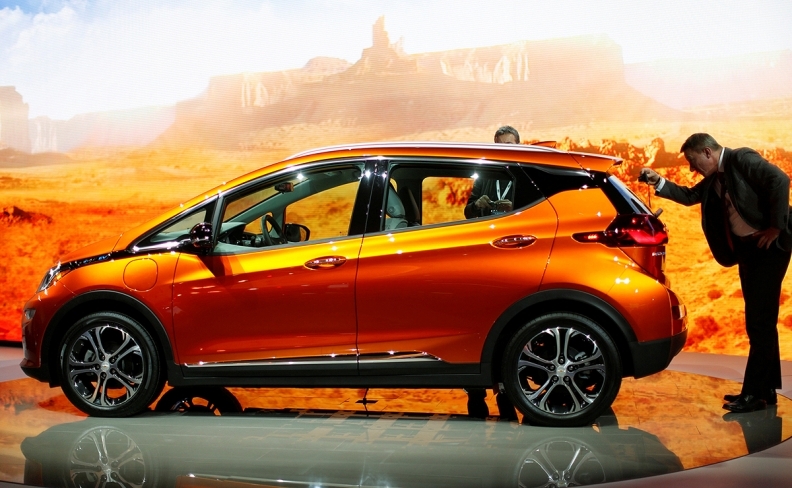 GM plans to sell 1 million EVs annually by 2026, driven by ongoing cost reductions and the debut of at least 20 new all-electric and hydrogen fuel cell vehicles globally by 2023. The product blitz includes four all-new vehicles by 2020, including two by April 2019, a company spokesman confirmed. Barra said GM expects the second-generation EV platform, which could underpin vehicles that exceed 300 miles in range, will drive total per-unit cost down 30 percent or more. That includes lowering the cost of battery cells to less than $100 per kilowatt-hour from $145 per kWh for the Bolt EV. Barra said the all-new modular EV platform will be used across several market segments and GM brands. To help reduce costs and increase flexibility of the platform, she said the company is integrating the battery cells into the architecture. At least two of the four vehicles planned by 2020 are expected to be small crossovers. Barra said GM will have an “all-new small CUV segment” with two entries and presence in two global markets -- presumably North America and China. She added that those vehicles will feature innovative technologies such as its Super Cruise autonomous highway driving system. “We are really heading into the sweet spot of where the retail market is and is heading,” she said. In the presentation, Barra said GM will eventually offer at least 11 kinds of vehicles off the new modular EV architecture, including a large SUV, a large luxury SUV and a "low roof car." GM, according to Barra, is working on speeding the installation of DC fast chargers for EVs that nearly all customers will be able to use. Barra provided no details about GM's plans to increase the availability of EV charging points, which is at more than 1,100 in the U.S., but said the company will “partner, incentivize or invest” to make it happen. GM will also expand its connected vehicle services such as OnStar and soon launch a new in-vehicle feature called "marketplace" that allows users to "do things, to order things" more simply than with a smartphone. The service, Barra said, is just one example of GM's efforts to monetize the data from more than 13 million connected vehicles, which create 3 petabytes of data annually. Autonomous vehicles, she said, will only add to those opportunities. "Make no mistake, we are here to win," Barra said.